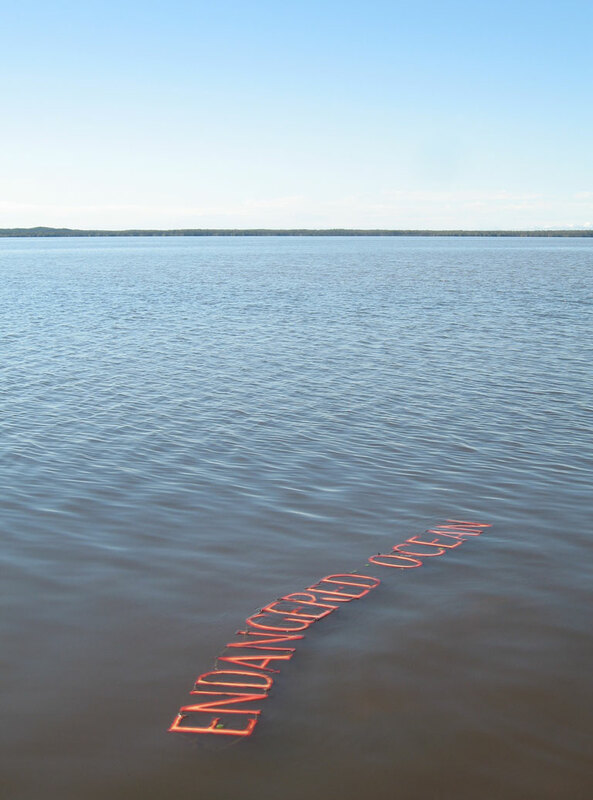 Floating land - Rising Seas. Created during the Artist and Writer's Symposium, Lake Cootharaba, Boreen Point, Noosa. The twelve hand cut word-strings were floated in the lake, across the land and in the air. They allude to and re-float past histories of Lake Cootharaba; Aboriginal and Colonial. My concept was to create strings of words, referring to our written culture. To assemble phrases that suggest past and present loss, combined with references about environmental neglect, global warming, the plunder of the oceans, rising seas, endangered coral reefs and storm wreckage. Before leaving New Zealand I had made a complete alphabet of plywood templates that we used for cutting the 200 or more characters needed to write the words. The space I chose for the installation was lush with flowering paper bark trees; stone slabs of lichen covered granite and tangled tree roots that travelled like veins over the rock surfaces and into the waters edge. The area was rich with bird life, dappled light and a place of calmness. I could listen to the unfamiliar bird calls and watch the birds patterns of movement through the space while I visualised the integration and placement of the installation. Initially working outside, and due to weather conditions I moved the power tools into the unused Fire Station. There we jig-sawed, burnt, stained, assembled and finally strung the words together. Several students from my one day workshop returned during the week to help with this process. The installation became a kind of outdoor room of text, contained by water lapping at the lake edge, roots of the paper bark trees, the overhead canopy of trees that led inland, platforms of rocks and occasionally by the word strings. Shadows of words were cast over the lichen covered rocks, onto the water and into the mossy crevasses, some text floated in the lake and others were suspended between the trunks of the paper bark trees. Hidden Currents, Lament, Tides of History, Floating Syllables, Endangered Ocean, Cradle of Life, Ocean Roar, Bleached Coral, Salt Tears, King Tide, Migration, Drifting Wreckage and Celestial Navigation. Over the next few days pelicans, canoes and launches came and went and whip birds could be heard in the early mornings. A storm brought winds and heavy rain that drenched and straightened the dangling word strings correcting their placement as they dripped ground-wards. Dimensions: Word Strings lengths vary. font height 350mm approximately. Materials: Natural fibre, plywood, ash and acrylic pigment.